Before we had the World Wide Web, we had UseNet. Developed in 1980, UseNet allowed a collection of computer users to interconnect via dial-up modems and post messages onto newsgroups (which resemble BBSes). Anywhere and anytime comic fans are able to congregate, you know they will be exchanging opinions and ideas about comic books - particularly DC comic books. In today's segment, Chris Sheehan examines what online comic fans were saying about Crisis on Infinite Earths. Please note: usernames have been removed for privacy reasons. 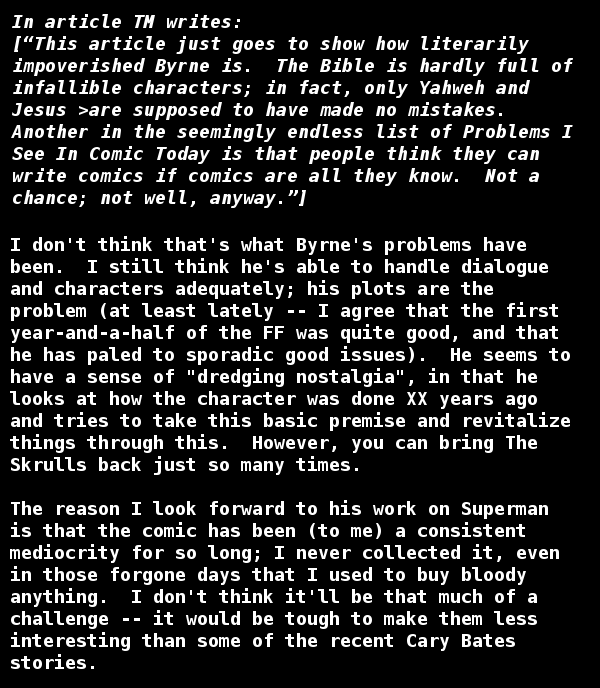 Over the past several entries, we looked at SM’s discussion piece wherein he opines on the no-longer-rumor of John Byrne coming in to revitalize the Man of Steel for the complex 1980’s DC Comics fan. Today we will finish up looking at the conversation his post encouraged. JM brings up some good points. It’s odd hearing an observation of Byrne’s "nostalgia dredging" even some thirty odd years ago. That is one of the more common contemporary Byrne complaints, so finding that it was also a fan-concern in the mid-1980s is quite eye-opening. 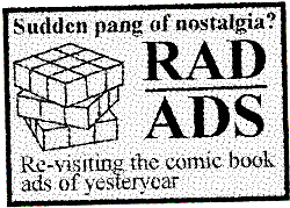 I echoed this same complaint during John Byrne’s unfortunate 2004 Doom Patrol revival, which saw the team returned to a more back-to-basics approach, which frustratingly attempted to cancel out all that came before it. It appears JM is cautiously optimistic about Byrne’s impending arrival, comparing it to what writer Cary Bates has brought to the table over the past several years. From my time digging through the usenets and any historical accounts available, I've concluded that folks were kind of burnt out on the kind of pre-Crisis stories Mr. Bates was serving up. 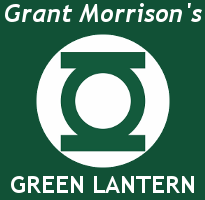 He was responsible for the overlong Trial of the Flash epic, which perhaps invited the sort of fan-malaise his name brought with it. Following the Crisis on Infinite Earths, Mr. Bates would take on the revitalized Captain Atom in a wonderful series. Well, here’s a good one. I suppose we can look at this a couple of different ways. First, let’s play it straight. 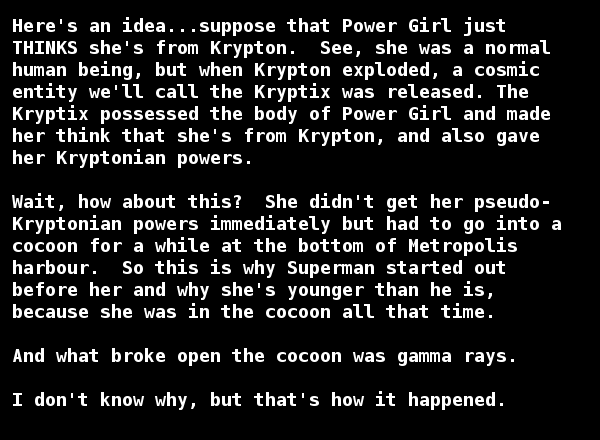 JG’s opening line is oddly prescient, as it points out the post-Crisis Power Girl thinks she’s from Krypton. 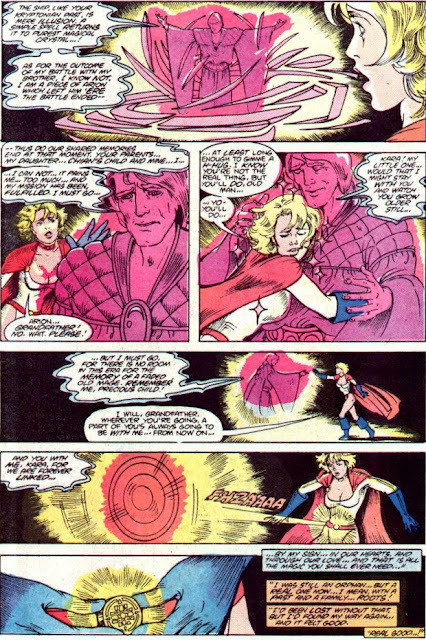 Initially during this era Power Girl did believe herself to be a relation to the Man of Steel. In the hotly discussed Secret Origins v2 #11 (1987), she finds herself onboard her symbio-ship... which appeared to have actually weathered the Crisis. She is an amnesiac with only the dimmest of memories of being raised on a sort of alien landscape. When she gives her ship the command to "find family", it zeroes in on Superman. It is, of course revealed that she is in actuality a descendant of the Lord of Atlantis himself, Arion, who had manipulated the situation to make Kara believe she was of Kryptonian heritage. Now with that out of the way, let’s take this on with the snark in which I feel it was intended. Ol’ JG is clearly having a bit of fun here referencing the whole nebulous Phoenix-Jean Grey dynamic over in Marvel’s X-Men. Following Jean Grey’s apparent transformation into the Phoenix in Jamaica Bay, and later "darkening" and death, the X-Men were left without one of their founding members. When Marvel sought to expand the X-Men comics line with titles such as New Mutants and X-Factor, editorial had the idea to have the "original five" mighty mutants reassemble… the only problem was, Jean was dead. It was a hotly controversial and publicized death to boot, so it would certainly be a challenge to undo. 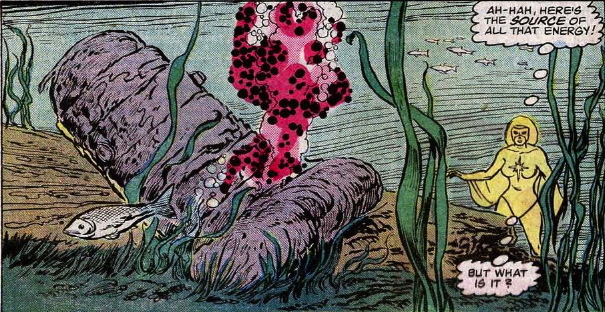 In issue #286 of Fantastic Four (1986), written by "You Know Who" (John Byrne wrote this, but left his name off perhaps to illustrate his disagreement with the proceedings), Jean Grey was found by the Fantastic Four and the Avengers alive and kicking in a Cocoon at the bottom of Jamaica Bay. As it would turn out the Phoenix Force and Jean Grey were two distinct beings rather than one in the same... this would assuage Jean of any of the guilt for the atrocities committed by the Phoenix entity, rendering her completely innocent and thereby "useable" once more. Well played there, JG... your snarky remark made me bust out some of my Marvel knowledge. That wraps up our coverage on SM’s John Byrne/The Man of Steel related entry (a subject that we will be sure to revisit). Next time we will be checking out the reaction to the arrival of another outsider to an established character, when we sit in for Alan Moore’s Anatomy Lesson from Swamp Thing #21. As I mentioned in our last several pieces... I know some corners of the interwebs have amazingly knowledgeable and passionate Superman fans, so if you have any additions or corrections, please feel free to contact me in care of this website. Thank you for reading. I like this post...I used to be part of Usenet in 1984-1986. The older fans did not like Secret Wars at all, but I did. Anyway, can you tell me how you are accessing these archives? I've got a way better idea than JG! How about making Superman the first superhero of the modern age in current continuity but having him face no classic enemies except for Bizarro, Darkseid, Luthor, and some Bronze Age losers no one cares about, have virtually no real adventures outside the JLA, and not do anything notable at all during that time period, while much of the continuity of Batman, the Flash, and Green Lantern is preserved to give them a sense of a seasoned history. And the best part is that Superman is treated like the most experienced superhero in the present day on the sole basis of being the first modern hero, although more of his past was spent doing absolutely nothing of note. Then when Superman starts fighting his classic rogues again, it'll be so late in his personal history that his counterpart, Batman, already has a large and varied gallery of villains.